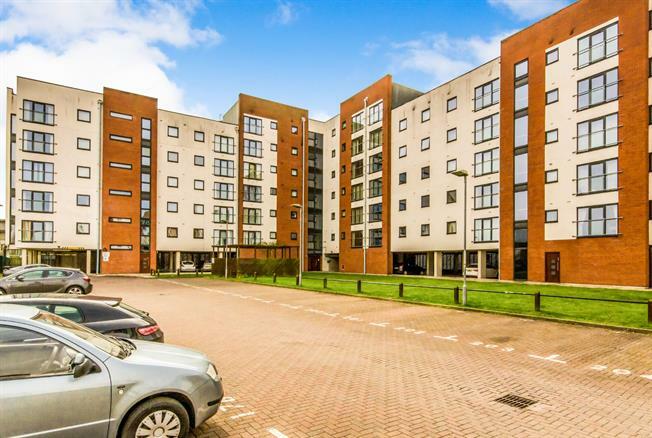 3 Bedroom Flat For Sale in Salford for Offers Over £130,000. An ideal buy to let investment, this spacious three double bedroom first floor apartment, is in an incredibly popular location with the Metrolink directly outside the development. Positioned on the first floor of the lift assisted block and allocated parking space in the secure gated car park. The property itself is entered via a secure intercom service and offers three double bedrooms, the master benefitting from an en-suite shower room and a separate family bathroom. The communal living space is a spacious open plan lounge with Juliette balcony, dining area and modern fitted kitchen with integrated appliances. Book your viewing today to avoid disappointment! Front entrance door, spacious hallway with access to all rooms. Storage cupboard housing hot water cylinder and space for washer/dryer, electric heater and intercom entrance phone. UPVC double glazed door, opening onto a Juliette balcony. Double aspect double glazed uPVC windows facing the front. Electric heater, laminate flooring. Open plan to the kitchen. Laminate flooring, tiled splashbacks. Granite effect work surface, wall and base units, stainless steel sink with mixer tap and drainer, integrated electric oven, integrated electric hob, stainless steel extractor, space for fridge/freezer. Double bedroom; double glazed uPVC window facing the side. Electric heater, laminate flooring. Featuring a walk-in shower cubicle, wash hand basin and WC. Heater towel rail. Double bedroom, tall double glazed window, laminate floor and electric heater. Double bedroom, double glazed window, laminate flooring and electric heater. Three piece white suite featuring; panelled bath with shower ove, WC and wash hand basin. Part tiled walls, vinyl flooring, heated towel rail and extractor fan.